Absolute care for your little one! 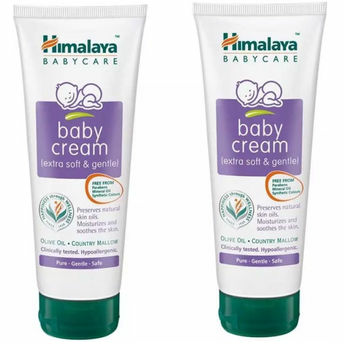 Himalaya's Baby Cream is specially formulated to protect your little one's chapped cheeks, 'crawler's knee', tender nose and rubbed elbows. Our cream protects against irritating wetness and windburn. The ingredients work together to moisturize your baby's skin and preserve its natural softness. Olive Oil, enriched with Vitamin E, nourishes, protects and softens skin and prevents chafing. It has soothing and antimicrobial properties, which keeps your baby's skin healthy and soft. Licorice protects and soothes your baby's skin. Applied topically, Licorice helps relieve symptoms of itching, swelling and redness.